St. Joseph is the perfect appellation for fans of Syrah based wines from the Northern Rhone Valley that are tired of the high prices being paid for the glamour wines from Cote Rotie and Hermitage. If you need discover the wines from St. Joseph, this article is for you! Plus, it’s important to know that not only are the prices fair, but the wines from St. Joseph do not demand nearly as much aging before they are ready to drink. The foundation of Saint Joseph dates back to 1292. During the 1500’s, the wine was revered and enjoyed by members of the royal family. The appellation of St. Joseph was created in 1956. At the time, the region only included wine from 6 communes. Those original 6 communes continue to produce the best wine of the appellation; Glun, Lemps, Mauves, St. Jean de Muzols, Tournon and Vion. The best terroir and soils in those areas are the granite hillsides. As you will see, that quickly changed. The boundaries of St. Joseph were increased in 1969. Today. 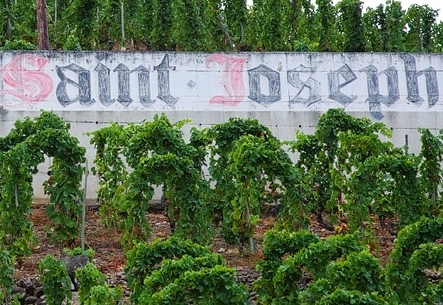 Saint Joseph allows a total of 26 communes to be used for making wine in the St. Joseph appellation. Saint Joseph has continued increasing in size. In 1971, only 97 hectares were under vine. Today, there are more than 1,200 hectares of vines in the appellation, making St. Joseph the largest appellation in the Northern Rhone Valley. Close to 115 different growers are active in the appellation. When you compare that with how few vines were planted in 1956, you get an even clearer picture on the expansion of the appellation. It’s important to note about the expansion of the appellation. That is because the original 6 communes in the north of St. Joseph, can often produce the best wines in the appellation. Today, the St. Joseph appellation is almost 65 kilometers long, from top to bottom. In the north you have Condrieu. As you travel south, to the bottom of the appellation you have Chateaubourg. There are rivers and streams that bring water to the appellation. With this much land, there is going to be numerous different terroirs, exposures, inclines and micro climates. Of course, vine age, vineyard management, soil, exposures and micro climates coupled are important factors that come into play when making a wine. All of that is something to think about when looking at which wines to buy from St. Joseph. The vineyards in St. Joseph are planted to both red and white wine grape varieties. The terroir of St.Joseph is mostly hillside plantings with granite, mica schist limestone, rock and clay soils, which as you now know, can vary widely, due to the size of the appellation. The large size of the appellation does not allow for uniform terroirs, which is why the quality of the wines from St. Joseph can be quite variable among all the different producers. In fact, the picking dates for the harvests can be as much as a week part when moving from south to north, which in rainy vintages can really alter the quality of the wines. The best terroir in the St. Joseph appellation is found in the closest proximity to Hermitage, which is to the south. The warmer temperatures in the south help the grapes reach better stages of ripeness. Vineyard farming practices in St. Joseph are moving more rapidly towards biodynamic farming, with the leaders of pack being not only Michel Chapoutier, but the local co-operatives. Roughly 93% of the appellation is planted to red wine grape varieties. AOC law allows for the blend to include up to 10% white wine grapes in the red wine, provided the gapes are co-fermented. The majority of the grapes are destemmed. Stainless steel tanks are preferred for the vinification by most producers. The majority of wine makers in Saint Joseph age their wines in barrel, with varying percentages of new, French oak barrels, used French oak and demi-muids for between 12 to 15 months. The wines of Saint Joseph are some of the most elegant, or feminine wines in the Northern Rhone Valley. They also drink well very early, if not on release and remain very well priced. If you are interested in the wines of St. Joseph, you should know that today, more young, dynamic producers than ever are making, bottling and selling their own wine. Less growers all the time sell their harvest to negociants or the local Cooperative. This trend really kicked into high gear after the 2003 vintage. You can now find vineyard designated and parcel selections from the St. Joseph appellation. The top producers in St. Joseph are: Chapoutier, Delas Freres, Guigal, Pierre Gonon, Domaine Coursodon, Andre Perret, Jaboulet, JL Chave, Philippe Faury, Eric, et Joseph Durand, Guy Farge, Michel Ogier, Domaine Aleofane-Natacha, Alain Voge and Ferraton. There is also a local cooperative, Cave de Tain which produces fine wine at fair prices and is situated in Tain l’Hermitage. The best vintages for St. Joseph are: 2015, 2012, 2010, 2009, 2007, 2005, 2003, 2001 and 1999.